Global warming brings more white Christmases ! Nature continues to defy the predictions of climate "scientists" with snow at Christmas in the US becoming more prevalent in the last two decades compared to the previous two. When real data from Rutgers Snow lab is analysed for the US it shows how idiotic these warmist predictions have been. The map shows the percent change in snow-covered days over the week of Christmas between 1990 to 2013 and 1966 to 1989. The colour blue indicates areas where the ground was more frequently snow-covered in recent years. Brown indicates areas where Christmases in longer-ago decades were indeed whiter. The map below shows the percent change in snow-covered days over the week of Christmas between 1990 to 2013 and 1966 to 1989. 'Many of us wondered whether we could trust our memories of how snowy the holidays were when we were kids compared to now,' the Goverment's climate team wrote. 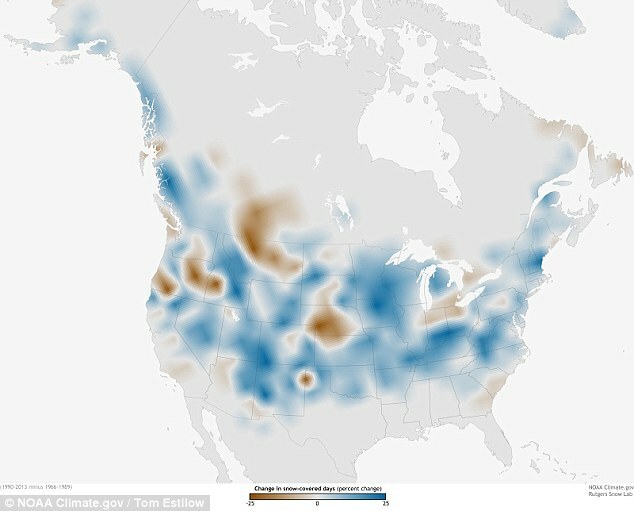 'Just for fun, we asked the experts at the Rutgers Snow Lab to show us what their data (based on NOAA satellite images) had to say about whether the U.S. snow extent during the week of Christmas has changed at all in the past 50 years. Blog postings have been light lately as I was reminded by a friend who follows Climate Common Sense for up-to-date correct information on the Global Warming Scam. Climategate showed the dishonesty of those climate "scientists" entrusted with maintenance of the global temperature record and the new scandal on Ph measurement is just as shocking. As global warming has paused alarmists have been focussing on ocean Ph or acidity levels claiming they are caused by CO2 and are causing all sorts of havoc in our oceans. This scare was supported by a paper which cherry-picked data from 1989 and omitted over a century of readings which completely falsified the conclusions of the paper. Christmas has come a couple of days early for climate sceptics, in what may well prove to be one of the biggest blows to the Global Warming religion since Climategate. According to Jane Lubchenko, the head of the National Oceanic and Atmospheric Administration (NOAA), it is “climate change’s equally evil twin” because of the disastrous consequences it may have for everything from the navigational systems of spawning salmon to the health of coral reefs. Ocean acidification is said to be caused when excess atmospheric carbon dioxide is absorbed by the sea, reducing its pH levels to make it more acidic. 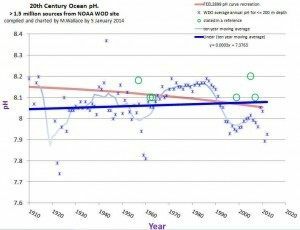 But, as Watts Up With That reports new evidence unearthed by an inquisitive graduate student suggests that “ocean acidification” may be a scientific fraud to rank with the great “man-made-global warming” scare. 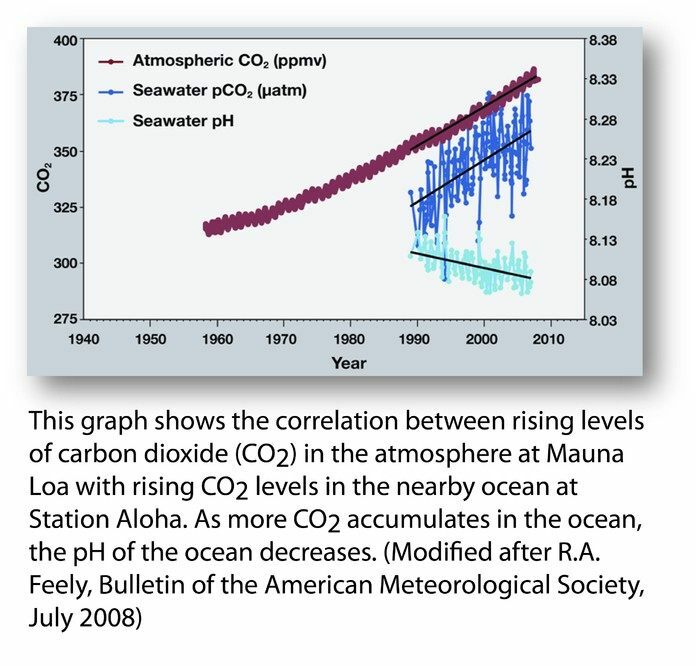 A 2004 paper by two of PMEL’s senior oceanographers – Dr Richard Feely and Dr Christopher Sabine – is often cited in support of “ocean acidification” theory and is reproduced, in simplified form, at NOAA’s website. It also formed part of testimony that Feely gave to Congress in 2010, again to the effect that increasing atmospheric CO2 is causing a reduction in seawater pH. However, it now seems that the paper’s certainty is at best misplaced, at worst outright dishonest. Not unlike Michael Mann’s discredited Hockey Stick graph it appears to depend on cherry-picked data and misleading projections in defiance of real-world evidence. The alleged fraud was uncovered by Mike Wallace, a hydrologist with nearly 30 years’ experience now working towards his PhD at the University of New Mexico. 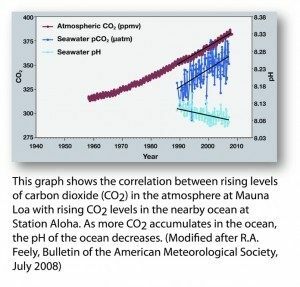 While studying a chart produced by Feely and Sabine, apparently showing a strong correlation between rising atmospheric CO2 levels and falling oceanic pH levels, Wallace noticed that some key information had been omitted. Mysteriously, the chart only began in 1988. But Wallace knew for a fact that there were oceanic pH measurements dating back to at least 100 years earlier and was puzzled that this solid data had been ignored, in favour of computer modelled projections. When Wallace emailed his query to Feely and Sabine, however, he found them less than helpful. This response, again, calls to mind the behaviour of Michael Mann in response to queries from Steve McIntyre about where to find the raw data for his Hockey Stick. Mann was similarly obfuscatory, rude and dismissive. Undeterred, Wallace eventually got hold of the instrumental records which Feely and Sabine had chosen to exclude from their graph of doom and plotted a time series chart of his own, covering the period from 1910 to the present. His results were surprising. 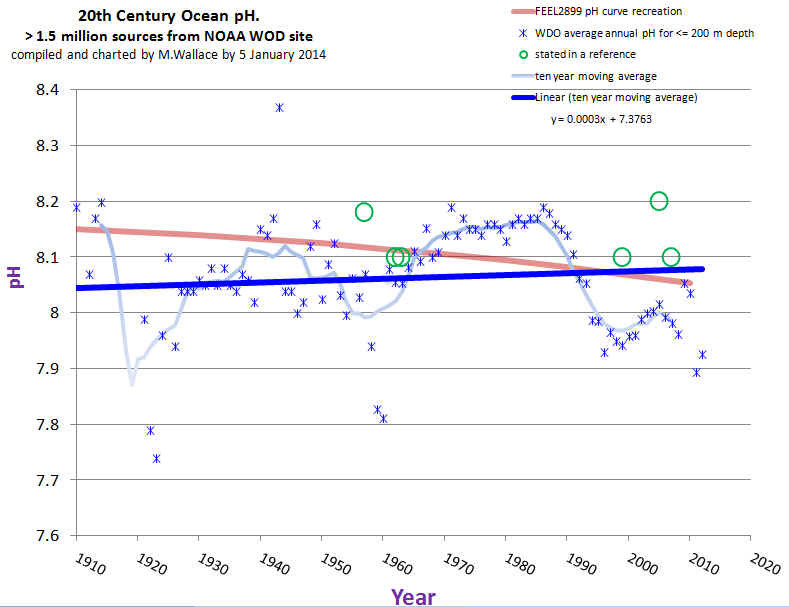 What they suggest is that global acidification is a figment of Feely’s and Sabine’s imagination: there has been NO reduction in oceanic pH levels in the last century. He adds: “In whose professional world is it acceptable to omit the majority of the data and also not disclose the omission to any other soul or Congressional body? Alarmists ramp up BS in run-up to Paris conference. With data tampering at NASA in overdrive to meet the 2014 "warmest year ever " requirement for Paris next year Paul Homewood examines the RSS satellite record for the year to date and compares it to previous years. As the satellite record does not suffer from UHI or locality issues it acts an accurate indicator of global temperature . It shows 2014 in 7th place which hardly justifies the hysteria alarmists are trying to generate.